In the years since its 1959 dedication, the Basilica of the National Shrine of the Immaculate Conception has had three main architectural focal points: on the exterior, its Great Dome and Knights Tower over the northeast Washington skyline, and in the interior, its dramatic Christ in Majesty Mosaic behind the main altar. With the Dec. 8 dedication of its interior Trinity Dome Mosaic completing its original architectural and iconographic plans, the national shrine has a new dramatic focal point, before it marks the centennial of the laying of its foundation stone in 2020. And Msgr. 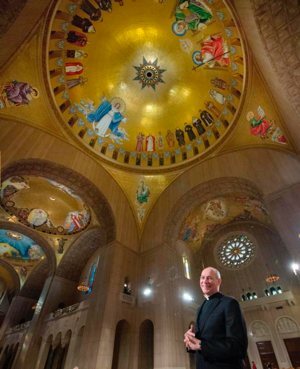 Walter Rossi, the national shrine’s rector, said in an interview that it is fitting that the Trinity Dome is centrally located in the nation’s largest Catholic church, and that the Holy Trinity is central to the new mosaic’s iconography. “The Trinity is central to the mosaic, because the Trinity is central to our Christian life and faith. This is how God has revealed himself to us as Father, Son and Spirit,” Msgr. Rossi told the Catholic Standard, newspaper of the Washington Archdiocese. Opposite the monumental figures of the Trinity in the mosaic is a nearly three-story high depiction of Mary as the Immaculate Conception, appearing as a beautiful young woman, her arms extended toward a procession of saints and holy people, ultimately pointing to her son Jesus. “Mary’s arms are outstretched to embrace us, just as the arms of Jesus in Christ in Majesty are outstretched to embrace us,” the rector said. He noted that those two main parts of the Trinity Dome Mosaic are based on 1953 designs by the shrine’s iconography committee as plans were underway to complete the Great Upper Church. “We altered the figures on the east and west sides to include saints of the United States, and saints who had a history with the national shrine, like Mother Teresa and St. John Paul II, and we also wanted saints that reflect the face of the people who come here,” said Msgr. Rossi. That procession of saints reflects the diversity of the nearly 1 million pilgrims from across the United States and from around the world who come to pray at the basilica each year. “This without question is the most diverse Catholic church in the United States,” the National Shrine’s rector said, noting that is why the saints in the mosaic include St. Juan Diego from Mexico, St. Lorenzo Ruiz from the Philippines, St. Josephine Bakhita from Sudan in Africa, and St. Kateri Tekakwitha, the first Native American to be recognized as a saint. Those holy people depicted in the mosaic include St. John Paul II, who in 1979 became the first pope to visit the National Shrine, where he prayed in the Our Lady of Czestochowa Chapel and addressed a gathering of women religious. Also pictured is St. Teresa of Kolkata, who visited and prayed at the basilica many times over the years. The saint in the mosaic with the most recent connection to the national shrine is St. Junipero Serra, the noted 18th-century Spanish Franciscan missionary of California who was canonized in 2015 by Pope Francis during a Mass celebrated outside the shrine, the first canonization ceremony held in the United States. In addition to St. John Paul II, the saints in the mosaic include two other popes: St. John XXIII, who was pontiff when the national shrine was dedicated in 1959, and Blessed Paul VI, who visited the shrine one year later as a cardinal. The Nicene Creed encircles the base of the Trinity Dome. The Trinity Dome Mosaic’s figures, symbols and words all together offer a visual representation of the Catholic faith, the priest said. “That’s what religious art is meant to be, a catechism. … Looking at religious art, people learn about the Gospel message, the lives of the saints and salvation history,” he said. Msgr. Rossi, 56, is in his 20th year at the national shrine. The priest of the Diocese of Scranton, Pennsylvania, was named rector in 2005. Before that, he was director of pilgrimages there for eight years. He said what inspires him most at the national shrine is witnessing the faith of the people who come to pray and worship God there.